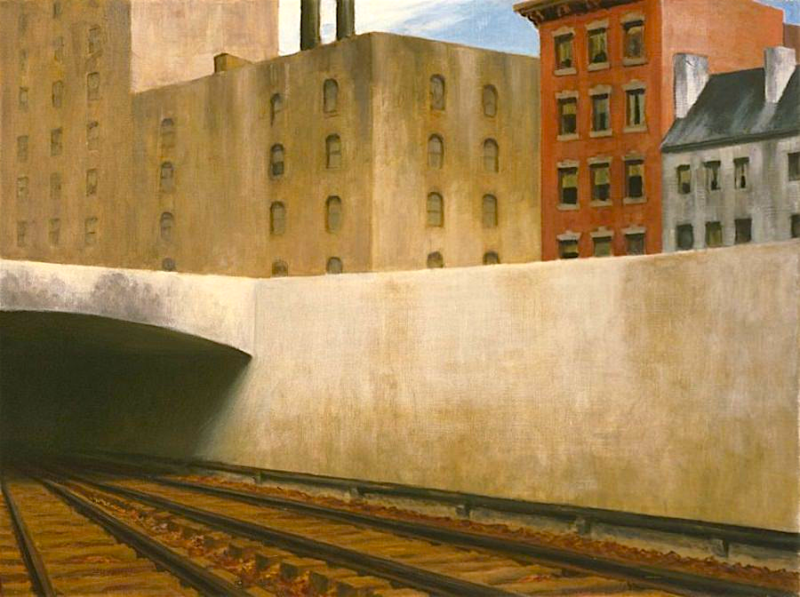 Edward Hopper painted “Approaching a City” in 1946, making it one of his later works. But it’s no less effective in depicting the isolation and stasis of the modern city—which visitors reach by traveling on a train, something usually associated with excitement and adventure. Not here. A potential threat lies ahead for travelers to this city (which is presumably New York, based on the tenements flanking the railroad tunnel). When asked about the painting in 1959, he answered tersely. 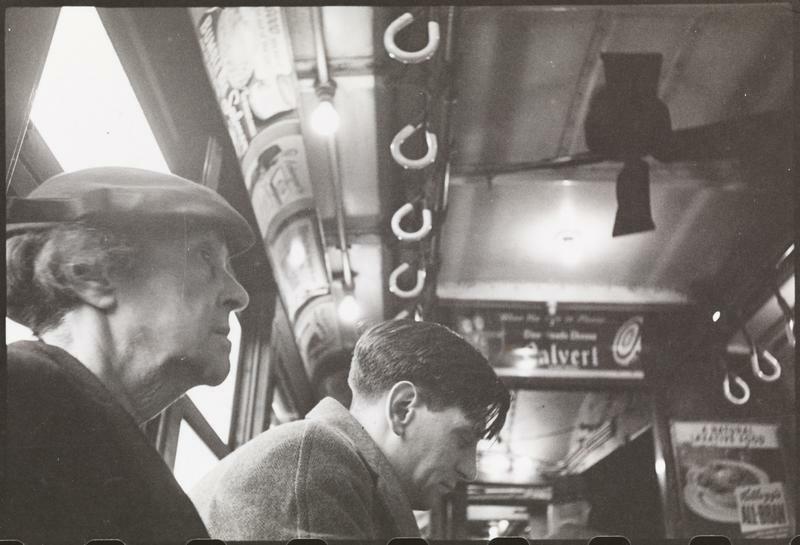 “Well, I’ve always been interested in approaching a big city in a train, and I can’t exactly describe the sensations, but they’re entirely human and perhaps have nothing to do with aesthetics,” Hopper replied. 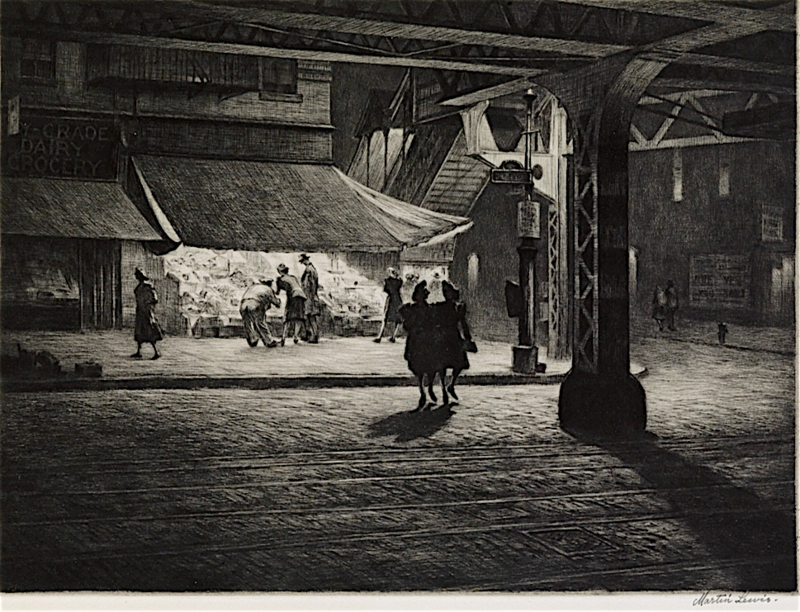 No one depicts New York’s shadows and light like Martin Lewis, who made numerous drypoint etchings of city streets and the people inhabiting them from the 1920s to the 1940s. 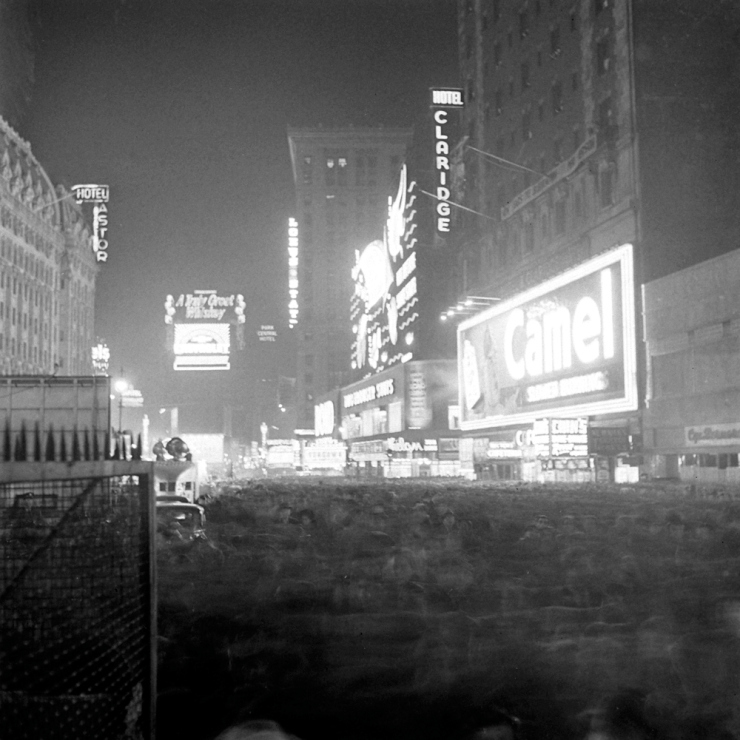 “Yorkville Night” reveals a corner under an unnamed elevated train in the postwar city. There’s darkness, but the streetcar tracks, pavement, produce stand, and station stairwells are brightly illuminated, giving us a peek into a fleeting moment in this Upper East Side neighborhood. The only thing we can’t see are the faces of the people. See more of Martin Lewis’ work here. She’s young and attractive, wearing a summer straw hat and see-through dress that doesn’t blow quite as much as the curtains in the window to her left do. Stepping out of her tenement entrance and standing at the sidewalk during the summer of 1943, she appears to be waiting—for what? 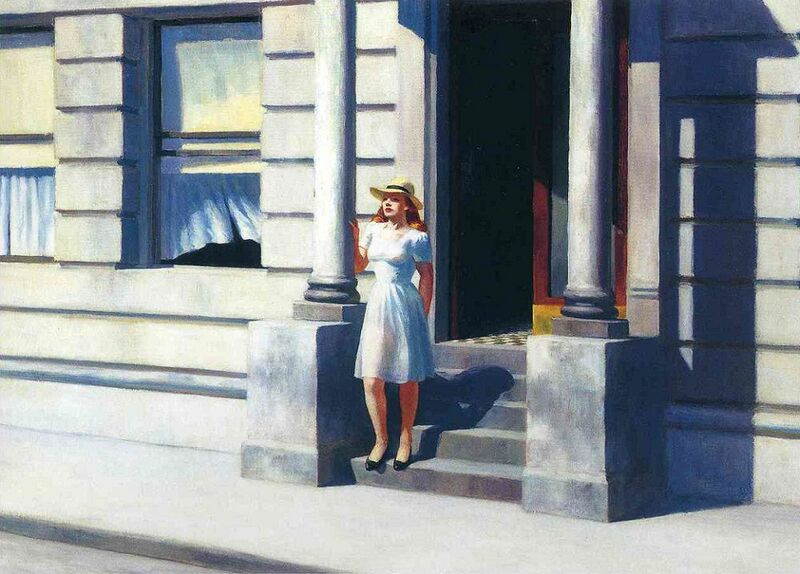 The writer behind Edwardhopper.net has this take on her, one of the many isolated souls Hopper depicted in New York in the first half of the 20th century. “The outfit, obviously new, refers to the increased prosperity of the nation, which at last had been able to put aside many of the difficulties of the Depression,” states the site. “She is part of the large group of young American females who had to survive the war years as best they could, years marked by a dearth of eligible young men and an abundance of money accrued from the jobs the war effort engendered.” Perhaps she’s waiting for the war to end, and the life she wants to begin. True, it wasn’t actually a subway. The steel road bed of the Second Avenue Elevated put belching trains two stories in the air from Chatham Square downtown to 127th Street. 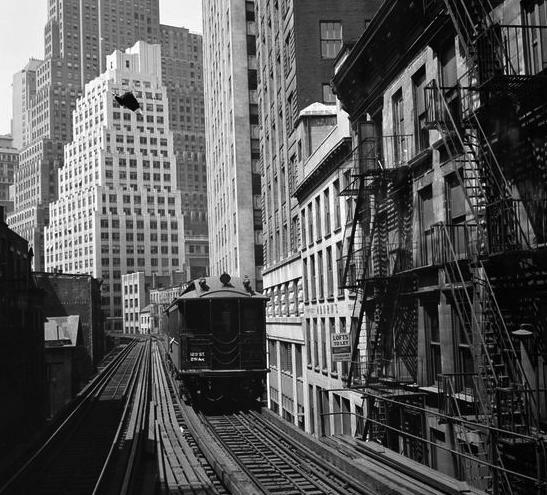 But this lurching, unglamorous el, as it was called, was Second Avenue’s very own rapid train from 1880 to 1942. It was a latecomer as far as els go. The Ninth Avenue line opened in 1868, while the Sixth Avenue and Third Avenue els were up and running in the 1870s. New Yorkers welcomed this el, which made the trip from City Hall to 59th Street in just 28 minutes, half the time it took via a horse-pulled, jam-packed streetcar. But it had drawbacks. Loud and gritty, the train ran day and night, raining ash on pedestrians and blocking out the sun. 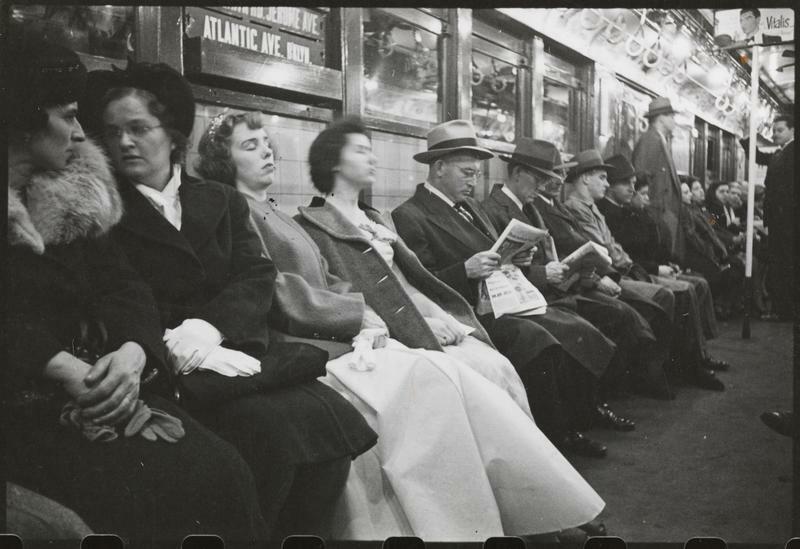 Still, the Second Avenue el helped colonize the northern reaches of Manhattan, transporting residents from crowded downtown slums to newer housing in areas such as Yorkville and Harlem. Unlike the Sixth Avenue El, which was memorialized by poets and depicted by painters, the Second Avenue line didn’t get much love. 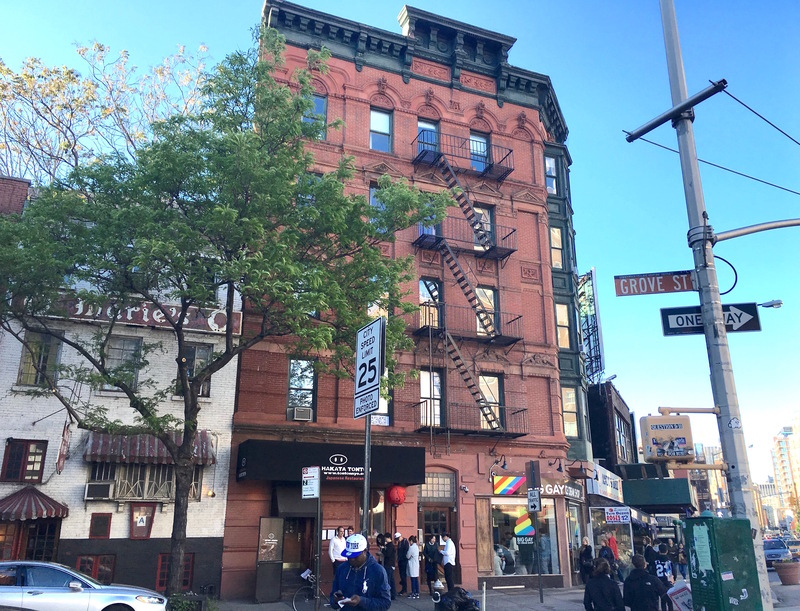 It did earn a gritty, gangland rep: Under its tracks at Allen and Rivington Streets in September 1903, the Five Points Gang and Monk Eastman’s Gang drew their guns and duked it out in a deadly turf battle. 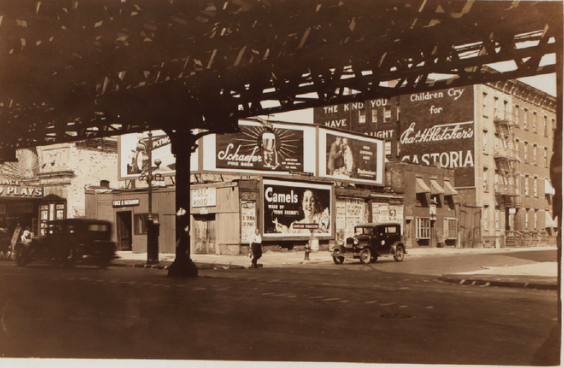 Through its 62 years, the Second Avenue el saw lots of changes. Powered by steam early on, the tracks were electrified around 1900. Ridership dropped when faster, more convenient subways arrived. 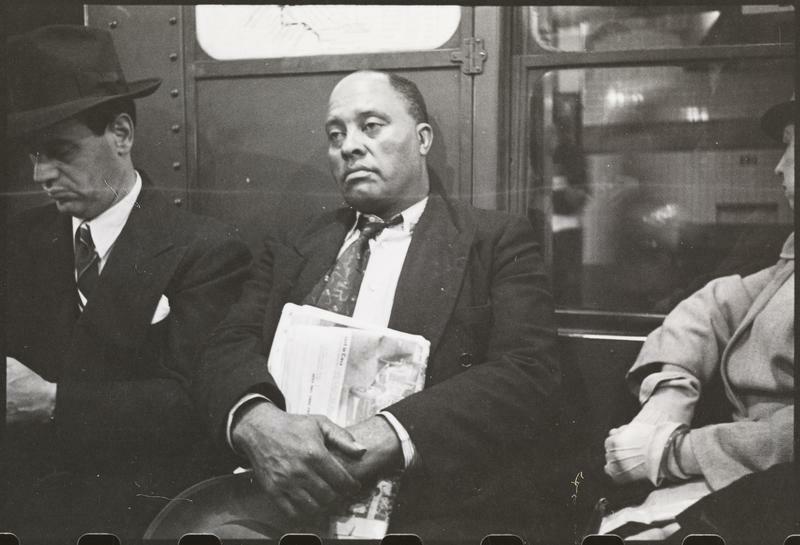 The city took the el over in 1940, and the end came in 1942. Miles of tracks were cleared away and the steel girders removed, making way for sunlight again. Now, the first leg of the Second Avenue subway is opening January 1. Think about the old el and how it shaped the East Side of Manhattan when you take a ride from one of the sleek new stations. The photographer behind the powerful and poetic images? Future film director Stanley Kubrick—at the time a teenage correspondent for the magazine who sold photo features on everything from city dogs to shoeshine boys to the life of a New York showgirl. 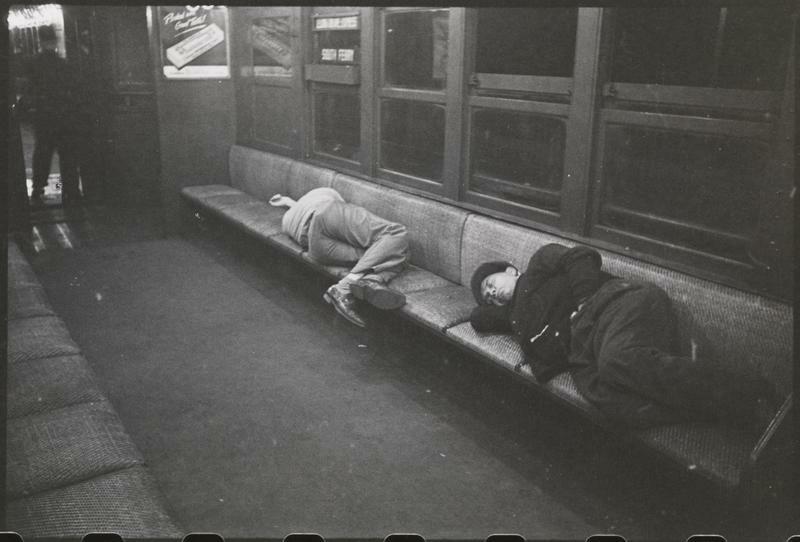 Like street photographers before him (think Walker Evans during the Depression), Kubrick decided to take his camera underground and shoot the people riding the trains. 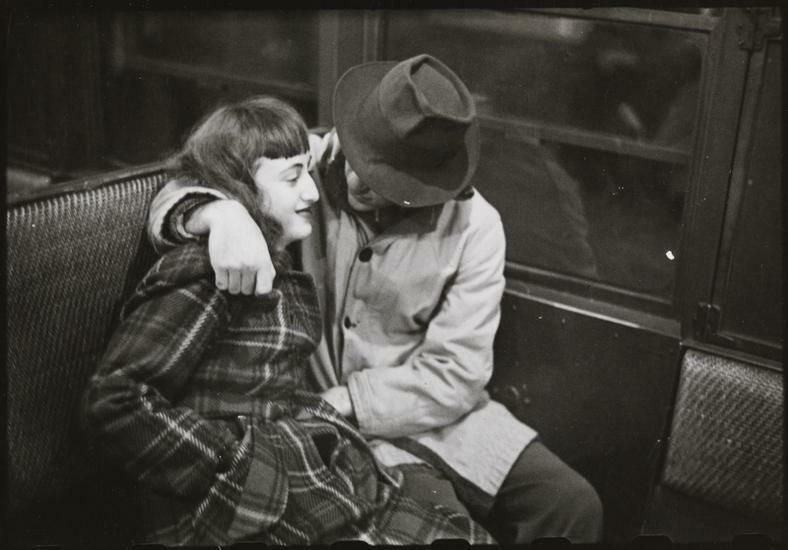 He hoped to reveal the emotion and humanity behind the typical subway rider’s facade of disinterest and indifference, to capture romance, humor, vulnerability, and loneliness. He explained how he did it in an interview with Camera magazine a year later. Kubrick used no flash, and apparently his subjects didn’t know they were caught on film. 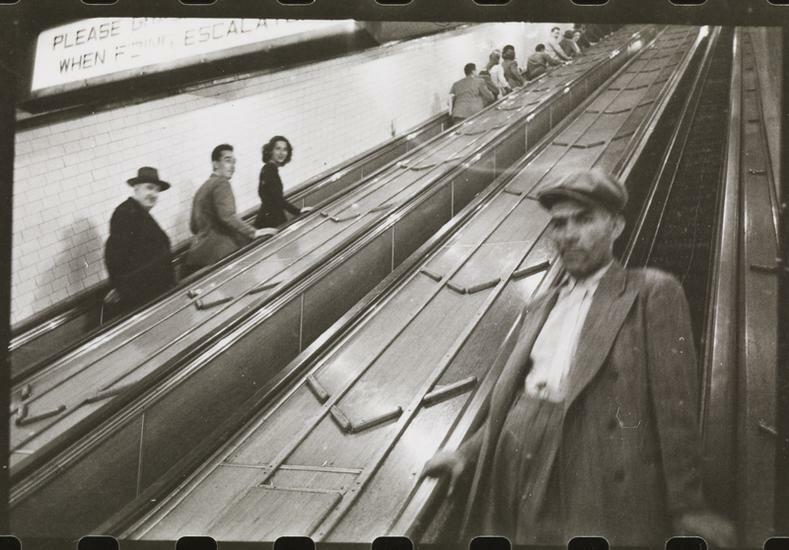 His images are striking in their ordinariness, not unlike the faces of subway riders under the streets of New York City today. Train interiors and platforms haven’t changed either. But taking pictures on a train in the 1940s posed challenges. 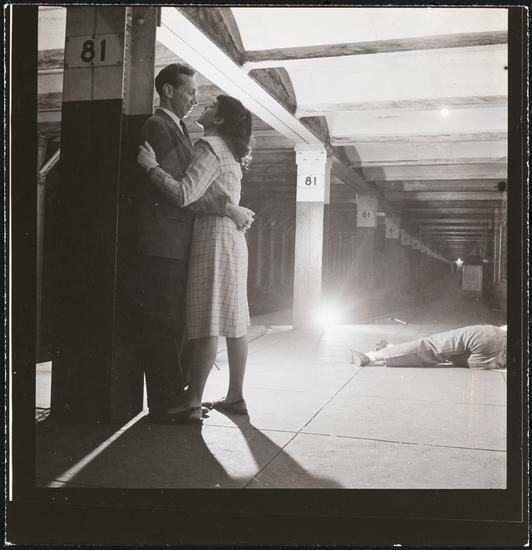 These photos and hundreds more from Kubrick can be viewed via Museum of the City of New York digital collections. 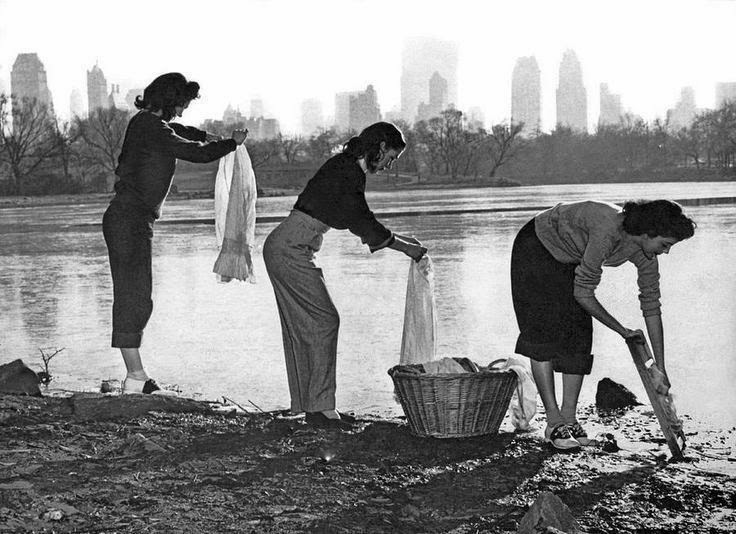 From the river pirates of the 1800s to the mobsters of the 20th century, New York’s once-thriving waterfront had always been riddled with crime. One man’s murder on a quiet West Village street in 1947 revealed just how depraved and corrupt the criminals who ran the piers could be. On the morning of January 8, 1947, Anthony Hintz was leaving the third-floor apartment he shared with his wife at 61 Grove Street (right). Hintz was headed to Pier 51, at the foot of Jane Street, where he was the hiring boss. His job was to run the “shape-up,” the process of deciding which longshoremen looking for a job that day would be picked to work. Almost all of the city’s piers were run by hiring bosses under the thumb of crime syndicates. The bosses would demand kickbacks from men who wanted to work, and the money would be shared with the mobsters. 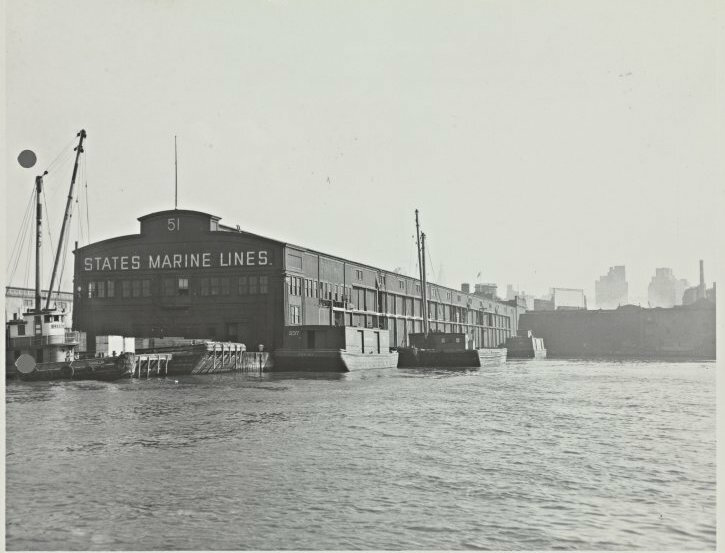 Pier 51 (below), however, was not controlled by the mob. Hintz refused to submit to gangsters. Naturally, the mob want to get rid of Hintz. 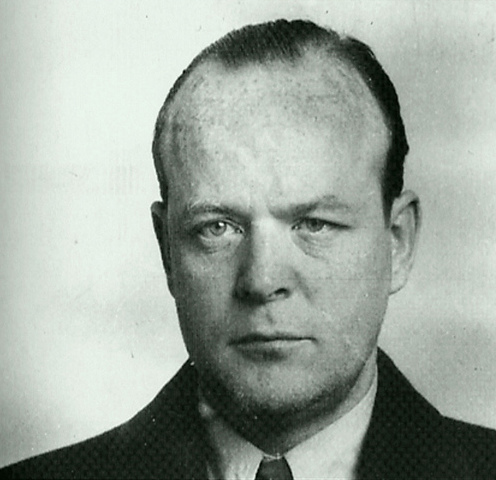 The job was undertaken by gangster and enforcer John “Cockeye” Dunn (left) and his associate, Andrew “Squint” Sheridan. On January 8, these two killers with the noir-ish nicknames (along with a thug and former boxer named Danny Gentile) lay in wait for Hintz beside the stairwell in his building. Dunn, Sheridan, and Gentile ambushed Hintz right just after he kissed his wife good-bye and walked out the door. He was shot six times and lay bleeding in the hallway in front of his wife, who came out to see what was happened. “Johnny Dunn shot me,” he said. Gravely injured, he was taken to St. Vincent’s Hospital up Seventh Avenue. There, he held on long enough to tell police that Dunn was the shooter. Hintz died three weeks later. Dunn and Sheridan were quickly arrested; Gentile turned himself in a few months later. All three were found guilty of first-degree murder and sentenced to the electric chair. 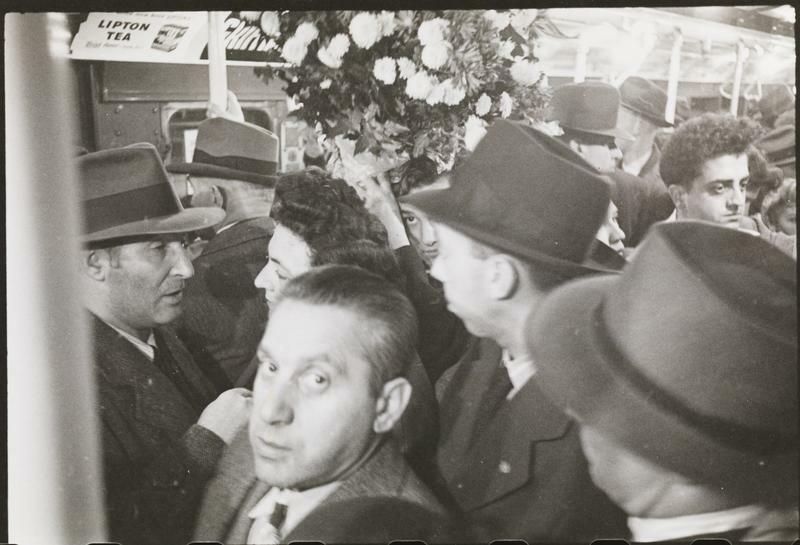 Gentile was lucky; his sentence was commuted. 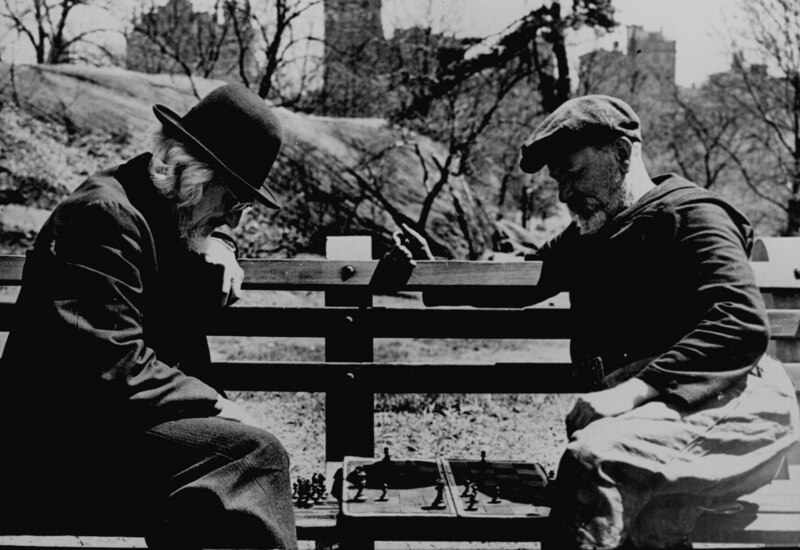 Dunn and Sheridan, ruthless and remorseless, were electrocuted in 1949. 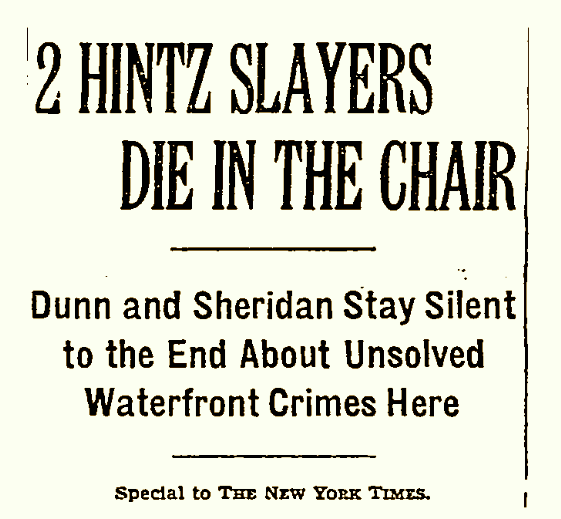 If any of this real-life mob murder sounds familiar, here’s why: the story of Hintz’s murder and an exhaustive New York Sun series about it inspired Elia Kazan’s On the Waterfront. Wartime New Yorkers still took the time to celebrate the new year, crowding into a Times Square ablaze with light in this Life magazine image. Life put together a slideshow of other photos that capture New Year’s Eve 1941: military policemen, soldiers and sailors dancing and drinking, and NYPD horses herding the crowd. At Fourth Avenue looking toward Astor Place, Arthur Leipzig took this black and white shot of the street and trolley tracks slick with rain from what looks like a cold, dreary downpour. 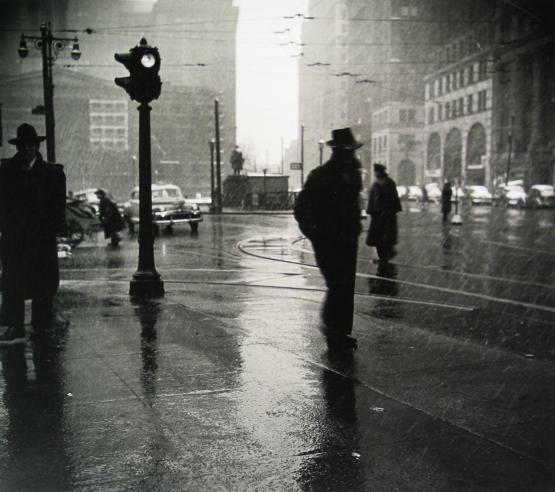 The image captures the strange beauty of the city under dark, rainy skies, as well as a provocative moment during an ordinary New York day: pedestrians going on their way, the glow of a single traffic light, parked cars that have accumulated snow. Leipzig, a wonderful photographer of New York’s moods and moments, passed away last Friday.